Waterfront 1915 Victorian home, convenient intown location, walk across the street to the uncrowded beach or to town for dinner, explore the historic district, relax, unwind, watch spectacular sunsets from porch rockers. Enjoy the atmosphere of a "by-gone era" with the comforts of today in charming Cape Charles, with no traffic lights or parking meters. Biking, birdwatching, fishing, wildlife refuge and state park nearby. 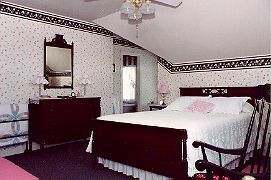 Large cheery rooms, central A/C, Hunter fans, clock-radios, TV/VCR's, bikes, guest refrigerator. Two rooms with Vermont Casting fireplaces for cozy winter nights. Breakfast features delicious award winning hot entrees, fresh fruit and homemade baked goods. AAA 3 Diamond. 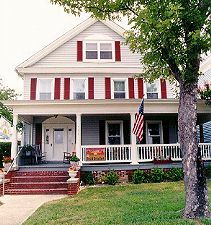 This and other Cape Charles Bed and Breakfast Inns can be found here in The Register.